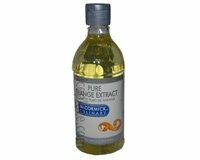 McCormick Pure Orange Extract originates from the oil of orange rinds. Use Pure Orange Extract to flavor marinades, and desserts such as compound butters, chutneys, syrups, chocolate sauces. Pure Orange Extract also can be used to flavor vegetable dishes including squash, sweet potatoes, carrots, peas, broccoli, and green beans. For baked goods, Pure Orange Extract is an excellent flavor for biscuits, breads, scones, cakes and cookies. 1 tablespoon of McCormick Pure Orange Extract, is equivalent to the peel of 1 orange. Ingredients: Alcohol (80%), Water and Oil of Orange. Refrigerate for at least 30 minutes before using. Use as a salad dressing or as a marinade for pork, chicken or seafood. Recipe makes 24 1 1/2 oz servings of salad dressing. Mix all ingredients together in a 2 quart saucepan. Heat over medium heat to a boil, then reduce heat to a simmer. Cook until a majority of the liquid is reduced and is becoming a syrup. Orange Pineapple Chutney goes well with chicken, pork and fish.